Detached House For Sale in Preston for Offers Over £260,000. 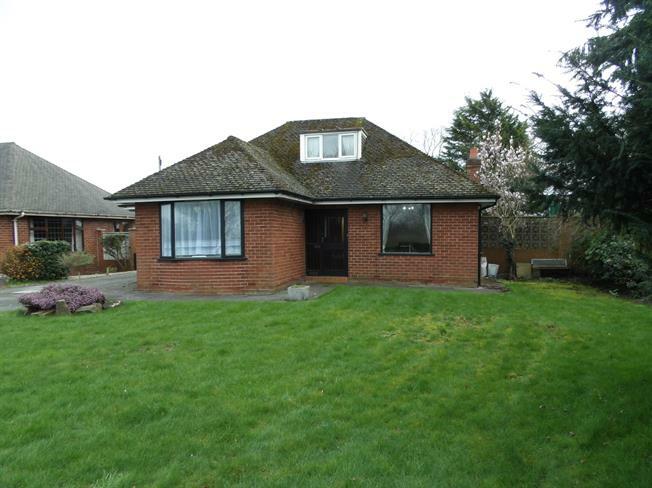 Detached bungalow boasting a fantastic sized plot, spacious rooms and no onward chain! Offering flexible living accommodation the property briefly comprises of a open plan kitchen diner, lounge, conservatory, hallway with two double bedrooms and a bathroom to the ground floor with a further third bedroom to the first floor. Externally there are private gardens both front and rear with a driveway to the side providing parking for several cars. A larger than average detached garage would be ideal for conversion and already used partially as a gym. Internal viewing is essential to appreciate this well presented family home. External door to the rear, laminate flooring, double glazed windows to the rear and side. Stairs to the first floor, carpet flooring and radiator. Two double glazed windows to the side, laminate flooring, wall and base units with integrated double oven and hob with space for fridge freezer and dishwasher. Built in storage unit housing boiler and plumbing for washing machine. Sliding doors opening to the lounge. Double glazed sliding door and window to side opening to the garden, windows to the front and side, carpet flooring, two radiators, gas fireplace with marble surround. Double glazed bay window to the front, carpet flooring, radiator and range of fitted wardrobes. Double glazed window to the back and front, carpet flooring and radiator. Double glazed window to the side, carpet flooring and radiator. Double glazed frosted window to the side, tiled walls and flooring, heated towel rail, four piece suite comprising of WC, shower unit, bath and sink.